Kenny is control systems engineer for a high-altitude wind energy startup. 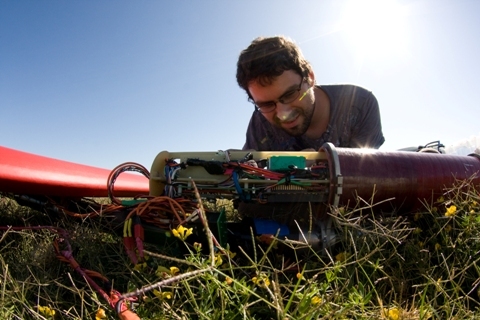 "Harnessing high-altitude wind requires sophisticated tethered aerial vehicles, which must be actively controlled to remain stable, " says Kenny. "My job is to develop the control systems that keep these vehicles flying safely and productively without human intervention." While he was a graduate student at UC Berkeley, Kenny studied the electrical and mechanical properties of carbon nanotubes, a new class of ultra-strong materials. In addition to helping to develop technology which will serve tomorrow's energy needs, Kenny also enjoys sailing around San Francisco bay. "Some friends and I recently converted an old sailboat into a "kite boat, " a boat propelled by giant kites, " he says. To some extent, his hobby helped informed his choice of career. "For me personally, an appreciation for the power of wind, gained from years of sailing and kitesurfing, made wind energy, over other equally important renewable energy sources, a natural choice." Though Kenny's research background was in carbon nanotubes, he has pursued his present career track with conviction. "Energy will be one of the great problems facing humanity in the 21st century, and physicists, with their strong technical background and physical intuition, are especially well positioned to attack this problem, " he says. "A solid understanding of fluid dynamics is critical for anyone in the wind power industry." What's more, Kenny feels that his Physics background helped him to teach himself the skills which were pertinent to his job. "I actually never took a fluid dynamics course. However, the math used is essentially the same as that for E&M, so it was easy to pick up." Kenny says he chose Physics because it was a natural fit for him, and allows him to use his skills to create and innovate. "At heart, I'm an inventor, " he says. "I like to create new and useful things. But to create truly new inventions (e.g. transistor, laser, etc...), you need to understand how and why things work down to the last detail, which requires physics."